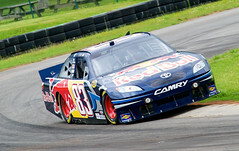 The Red Bull Racing Team was looking for a competitive advantage by adopting technology that was rugged enough to survive the grueling and hostile NASCAR racetrack environment. It also wanted to automate the collection and distribution of critical car performance and equipment data in real-time to speed decision making at the track. Working with real-time data would let the team make quicker decisions that could affect the outcome of each race – when to call for a pit stop, tracking how much fuel goes in the tank, how the tires are wearing. Mired for years in outdated pencil and paper and dry erase boards, the team needed a rugged PC that could run Microsoft Windows 7 and its racing software. One that could survive track temperatures reaching 138 degrees and being left out in the rain. MobileDemand offered an Intel® Atom™-powered solution that saved The Red Bull Racing Team both time and money. NASCAR is a high-tech sport where seconds separate the winner from the rest of the pack. It has a U.S. fan base of 75 million and through its three major series, Sprint Cup, Nationwide and Camping World Truck, sanctions more than 1,500 races at 100 tracks in 39 states, Canada and Mexico. The average attendance at an event is greater than 120,000 and fans spend some $3 billion annually on NASCAR officially licensed products. Since its founding in 1948, it has helped define the racing industry and pushed automotive racing technology to the bleeding edge. But while the automotive technology took off, data collection technology lagged behind and the use of pencil, three-part paper forms and dry erase boards perpetuated. It would often take at least 15 minutes for that information to be available to all the other team members. Racing strategy is based on data. Many times the team would not get the data in time to make strategic decisions before the next pit stop. 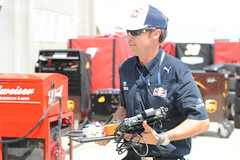 Red Bull Racing needed a way to collect and share more data in real time. The MobileDemand xTablet offered the mobility, processing power, ease of use and ruggedness needed to automate data collection, saving vital crew time before the race and shaving precious seconds during the race. The goal of using the xTablet T7000 ultra mobile computer was to automate data collection for the team to speed the sharing of information for quicker decision making. What started out as a search for a product to replace a standalone bar code scanner produced a single, rugged tablet with barcode scanner to automate routine and time consuming tasks. 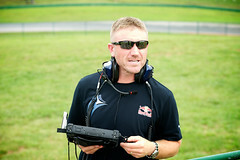 As the first NASCAR team to adopt the rugged xTablet PCs, Red Bull Racing has been able to take advantage of the MobileDemand devices to give them a competitive edge. 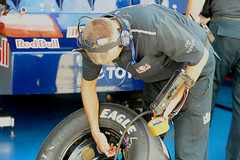 “We’ve sped up the data flow probably more than a hundred fold,” said John Probst, Technical Director, Red Bull Racing.“ The tire guys said the first weekend we had the tablets at the track it saved them 90 minutes just in sorting tires.” One example of that efficiency is the fact that tire specialists can use the built-in bar code scanner in the tablet to scan all the tires prior to the race and build sets of four for change outs during pit stops. By using that one function alone they now save 90 minutes before every race matching tires for sets. The versatility and ruggedness of the tablet PC give the team a competitive advantage because it runs the team’s racing software on Microsoft Windows 7 and provides a quick, comprehensive data collection and sharing solution. And, unlike off-the-shelf PCs, the military rugged tablet PCs will survive the rigors of an entire 39-event racing season. When a multi-million dollar race is on the line, seconds matter. Now, the Red Bull team shares critical information in real time through a single, integrated automated data collection system that saves seconds, minutes and hours at every event. It’s setting a new standard at the track.